Sustainable Urban Drainage Systems (SUDS) as a promising nature-based solution are the focus of the new chapter, written by Ecologic Institute's McKenna Davis and Sandra Naumann. The authors utilize a range of case studies and evidence from across Europe to underline the potential of SUDS as a tool to reduce the negative effects of urban flooding and resultant water pollution. The diverse environmental and societal co-benefits are also presented as well as insights on the potential cost-effectiveness of SUDS as compared to grey infrastructure solutions. In addition to highlighting the relative advantages of nature-based solutions, the chapter outlines current social and political barriers, which must be overcome to enable a wider uptake of SUDS, and presents approaches that can be used to support this process. The entire book is open access under a CC BY 4.0 license and available for download. 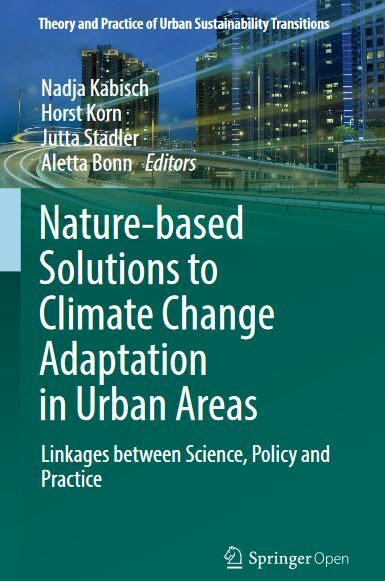 The Springer book "Nature-Based Solutions to Climate Change Adaptation in Urban Areas" brings together research findings and experiences from science, policy and practice to highlight and debate the importance of nature-based solutions to climate change adaptation in urban areas. Emphasis is given to the potential of nature-based approaches to create multiple-benefits for society. The expert contributions present recommendations for creating synergies between ongoing policy processes, scientific programmes and practical implementation of climate change and nature conservation measures in global urban areas. McKenna Davis and Sandra Naumann 2017: Making the Case for Sustainable Urban Drainage Systems as a Nature-Based Solution to Urban Flooding in: Nadja Kabisch, Horst Korn, Jutta Stadler, Aletta Bonn (eds. ): Nature-Based Solutions to Climate Change Adaptation in Urban Areas. Linkages between Science, Policy and Practice.